alaTest has collected and analyzed 14 reviews of Panasonic KX-TG8564EW Cordless Phone with Answering Machine (DECT,Hands Free Functionality, Low Radiation) WHITE Model. The average rating for this product is 4.5/5, compared to an average rating of 4.0/5 for other Cordless Phones for all reviews. We analyzed user and expert ratings, product age and more factors. Compared to other Cordless Phones the Panasonic KX-TG8564EW Cordless Phone with Answering Machine (DECT,Hands Free Functionality, Low Radiation) WHITE Model is awarded an overall alaScore™ of 89/100 = Very good quality. 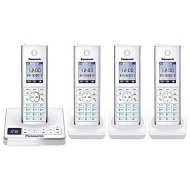 alaTest has collected and analyzed 14 user reviews of Panasonic KX-TG8564EW Cordless Phone with Answering Machine (DECT,Hands Free Functionality, Low Radiation) WHITE Model from Amazon.co.uk. The average user rating for this product is 4.5/5, compared to an average user rating of 4.1/5 for other Cordless Phones on Amazon.co.uk.